Co-Citations | Did Google Add 1 More Signal to the SERP List? Co-Citations – Did Google Add One More Signal to the SERP List? From panda to the latest pigeon(by SEL) algorithms are changing day by day, these updates are ruining out our SEO work. Now messing up with old SEO tactics doesn’t work anymore. After Google introduced algorithms like panda and penguin we started fetching new and reliable ways to build backlinks. Factors like backlink’s anchor texts and keywords are loosing it’s importance by continuous update of algorithms. Everyone of us once used keywords for linking to the site but now using long-tails because of it’s search compatibility .Gaining authority doesn’t end with backlinks. Now it’s time for co-citations. it’s time to say anchor text is diminishing but not completely. Google started giving importance to these surrounding texts. Words on the pages that linking back to a pages always play a vital role. 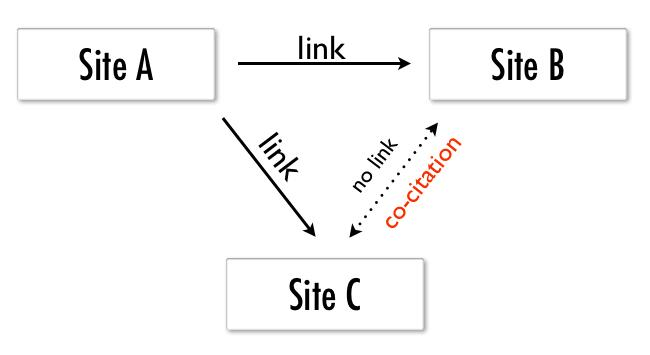 Few refer it as pseudo linking which means when a site A links to Site B and Site C through a post then these sites are linked with each other even though there is no direct link from Site B to Site C. Co-citations helps Google to find similarities of two web pages due to the third web page referring to both of them. Links are the powerful ranking signals than this co-citations but both have their own merits in the eyes of Google algorithms. Most of us vigorously try to get backlinks from higher authoritative websites but while linking back to the authoritative websites also we need to maintain the balance in link eco-system. Linking back to authoritive websites gives a postive signal to Google . You may feel frustrating in this competitive world linking back to other websites is just like aiding the competitor but the trick is find out the authoritative website related to the same topic but not in competition. I mentioned in my previous blog post how to rank a zero content site is based on same concept. On the other side, linking to poor quality website and linking to a website with irrelevant topic & low social share, Google might think that you are trying to manipulate the rankings, moreover algorithms can easily figure out this kind of tactics. When a site A links to site B and Site C , if site B is more authoritative than Site C then authority of site B is benefit to the Site C. You can use this trick during guest posting which benefits you a lot. Here the concept is first the Authority flows forward and then backward like it’s just a transitive relation. The concept of co-citations and co-occurrence is quite confusing but the basics of making use of it is to keep the words wisely that are surrounding the link as it influences more. Never link to bad websites instead link freely to authoritative websites (relevant sites). This entry was posted in blogging on Aug 11, 2014 by Rajesh. Need think i came to know about. I thing the best advantage of this would be from Guest blogging….right?